DAMMAM (SAUDI ARABIA): The Indian U-19 National Team lost 5-0 against hosts Saudi Arabia in their opening match of Group D of the AFC U-19 Championship Qualifiers at the Prince Mohammad bin Fahad Stadium here, today (November 04, 2017). The Indian Colts were slow off the blocks as the hosts tried to take an early advantage, pressurizing the Indian midfield to commit mistakes. Dheeraj Singh was called into action as early as the 9th minute when he thwarted a Saudi attack from the flanks. A minute later, the hosts could have taken the lead but Abdullah Alhamaddan failed to net the ball after rounding up Dheeraj. In the 15th minute, India gifted the lead to Saudi Arabia after Anwar Ali’s pass was fell to Abdullah Alhamaddan, who slotted the ball into the net to give the hosts a solitary goal lead. Pursuing the equalizer, the Indian colts started to look for counter attacks but were held at bay by a stern Saudi defence. Ashis Rai’s one-two with Rahul K.P. resulted into the former onto goal but Rai could only release a feeble shot unable to trouble the Saudi custodian in the 26th minute. In the 50th minute, Saudi Arabia doubled their lead when Feras Albrikan rounded off an onrushing Dheeraj Singh and scored to make the scoreline read 2-0. Coach Matos introduced Edmund and Amarjit Singh to spice up things and Edmund’s shot in the 72nd minute from outside the box was lost in the jungle of Saudi legs defending their box. Saudi Arabia added another in the 75th minute to seal the match after Al-Shahrani blasted the ball into the net, capitalizing on scuffle inside the Indian box. Saudi Arabia added another through Al Brikan in the 81st minute to make it 4-0 before he added another in the 86th minute to make it 5-0. At the end of 90 mins, the scoreline read 5-0 in Saudi Arabia’s favour as India succumbed to a defeat. 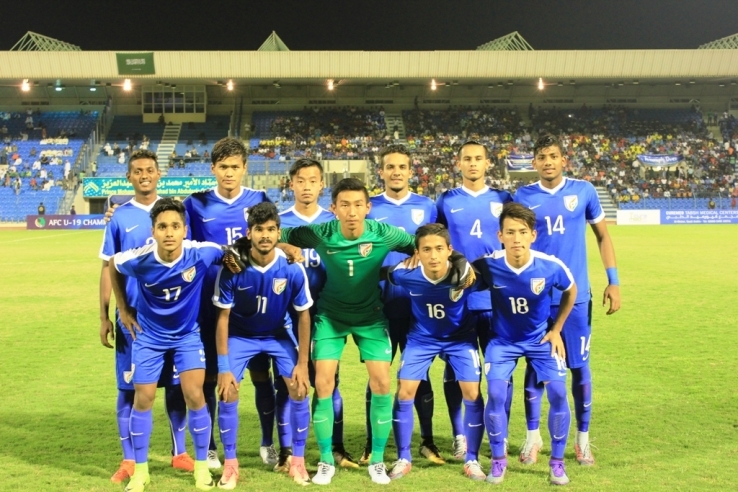 The Indian U-19s face Yemen next on November 06, 2017 before clashing with Turkmenistan on November 08.